First question I have is what is this wire and where does it go? 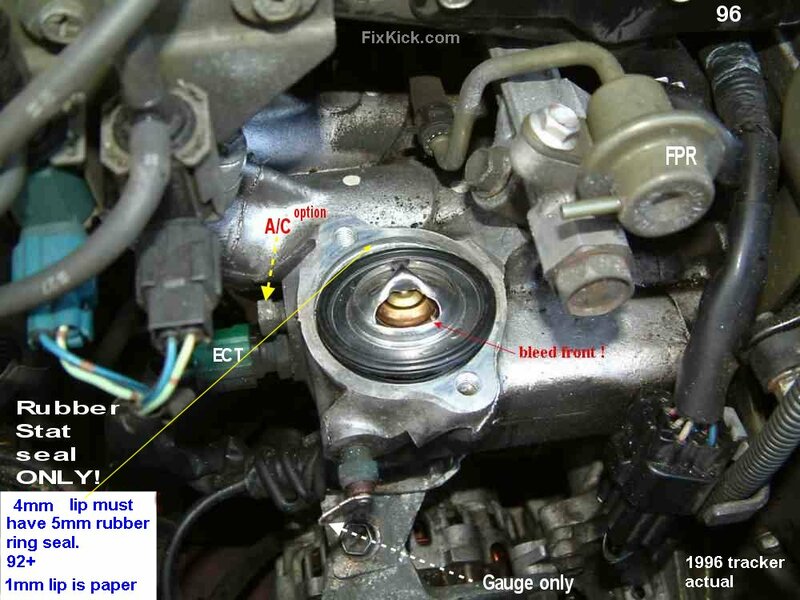 Also does anyone have a diagram showing the routing of the clutch cable? I know theres a clamp on the drivers fender but how it goes from there to the passenger side im not 100% sure. Edit because im silly and didnt post the obvious: 1995 geo tracker 16v 1.6l, manual, 4 wd, hardtop, 2 door, does have ac. WHAT CAR? year, engine 8v or 16valves , trans, 2wd/4wd, 4 doors or 2, all wiring varies by those factors. does it have AC? yellow- with blue stripe it seems. yellow blue is AC engine overheat sensor, if no AC its not connected. (08-22-2018 11:41 AM)droptop351 Wrote: First question I have is what is this wire and where does it go? clutch cable goes forward, then down, then make U turn, under rad bottom tank , clip there, and back to the mount for frame holder for cable then insided cable to bell lever. 10 years ago, it's all I remember. there were other clips too on left side (driver) also, new strut left top. Thanks! I edited the original post to include the information. Ive got it plugged in just above the green connector thats near the thermostat I assume that to be the correct location. : 1995 geo tracker 16v 1.6l, 6sp manual, 4 wd, hardtop, 2 door, does have a/c. ok, yes 2door less connectors, no rear wiper no rear washer wires dangling. and more. there are 3 water temp sensors on this car. 2: the 1 pin way front is gage water temp.